Former US President Jimmy Carter recently severed his ties with the Southern Baptist Convention after six decades. He posted an article in The Observer on July 12, 1999 explaining that it was due to the organization's decision to prohibit women as deacons, pastors or chaplains in the military service. Much of what President Carter wrote is common sense in that we are all equal in the eyes of God. I'm not going to comment about anything that the Southern Baptist Convention has decided upon for themselves because I have not looked into what they teach or their reasoning. I do feel pressed to comment on the president's implicit attacks on the catholic church's teaching that women cannot be priests. Especially wrong are his claims, right after admitting that he has no religious or theological training, that there were female priests in the first centuries. 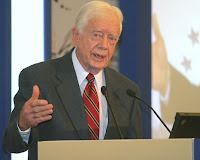 President Carter goes on to claim that it was not until the fourth century that "dominant Christian leaders, all men, twisted and distorted holy scriptures to perpetuate their ascendant positions within the religious hierarchy." The president's claims that women in the first centuries were priests and bishops is wrong. There were heretical sects and pagans that had female priests but not Christians. There were deaconesses that were basically the forerunners of nuns but there have never been female priests. What is the opposition to female priests? I don't think anyone will deny that women are capable of being priests. It's more of the fact it is just not possible for the church to ordain women. The Church teaches that while we are equal we are not the same. To start off with, when Jesus chose the twelve apostles to whom he gave His authority on Earth He chose all males. Some will refute and say that Jesus was merely following the cultural norms of the day. I don't know if you noticed this but Jesus wasn't really one for following cultural norms. He sat with thieves, tax collectors and prostitutes. He sat with the Samaritan woman at the well and said that He is the Son of God. Jesus was not really afraid of rocking the boat. But He did not choose women as His apostles. I don't know why. You can call Jesus sexist if you want to but I'm going to guess that he had a good reason. The Catholic Church is following the wishes of Jesus in not ordaining women. It cannot ordain women. It just simply is not possible. To be ordained you have to receive the sacrament of Holy Orders. Sacraments need certain things to be valid. For instance you cannot baptize someone with soda pop or baptize them in the name of the "Creator, Redeemer and Sanctifier." You can not transform Ritz crackers and grape juice into the body, blood, soul, and divinity of Jesus in the Eucharist. To be ordained you have to have-----a baptized male. Otherwise it will not be valid. What are the chances of the Church changing it's stance? None. Zero. Zilch. In 1994 Pope John Paul II stated in Ordinatio Sacerdotalis that "I declare that the Church has no authority whatsoever to confer priestly ordination on women and that this judgment is to be definitively held by all the Church’s faithful." Just because the Catholic Church does not have female priests does not mean that it does not think that women should not be held in high esteem. She has quite the devotion the the Virgin Mary. Several of the doctors of the church, including St Catherine of Sienna and St. Therese of Lisieux, are women. Women are our mothers, our sisters and our wives. We are to love them as "Jesus loved the Church." Women hold many ministerial positions in the church. They are music ministers, youth ministers, they are parish directors. The Church teaches that we are to respect women---they just cannot be ordained. I commend the hard work and Christian values that President Carter has done over his life time. I'm not challenging his decision to leave the Southern Baptist Church. I do believe that when someone like President Carter attacks the teachings of the church it's important to defend the the faith.. There are many ways for women to serve within the Catholic Church. The priesthood simply isn't one of them. On the other hand, as a "reformed Protestant", I'm aware that many Protestant denominations do allow women to serve as pastors. And the Baptists don't. Although I have tremendous respect for President Carter's humanitarian efforts, I disagree with him on him on this issue. After more than half a century as a member of the Baptist faith, he should well know that women aren't allowed to serve in this capacity there. It's a common thing for democrats to treat genders as interchangeable and make a big fuss out of it. So the Catholic church doesn't allow women as priests, so what? Read the bible, the Catholic church glorifies women, they even give their special devotion to Mary, who was conceived without sin. I find it strange though, for an ex-president to talk about something he wasn't familiar with, i.e. the Catholic Church. And the fact that women are not allowed to be priests doesn't mean that men can abuse women. I just don't see the logic in that. I am saying this to represent my beloved Catholic religion, as for other religions he mentioned in his statement, I won't say anything.